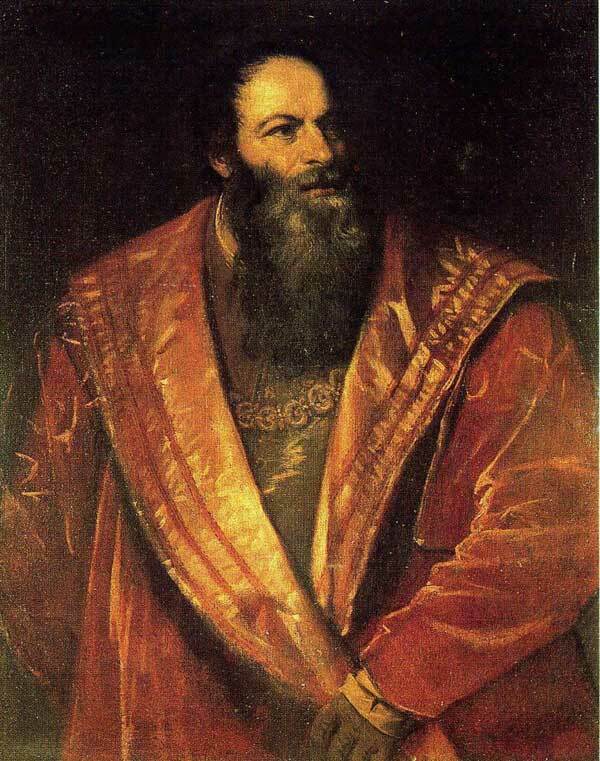 Titian, the renaissance master from Venice. The Venetian master of colour. Titian, his birth name was Tiziano Vecelli, was born between 1485-1490 in Cadore in the southern Alps, and was rumoured to be over ninety years old when he died of the plague in 1576. Self-Portrait C.1567 (s) Oil on canvas. Madrid. The eldest of four sons he was known as Da Cadore, after his place of birth and the family were well known in the area. 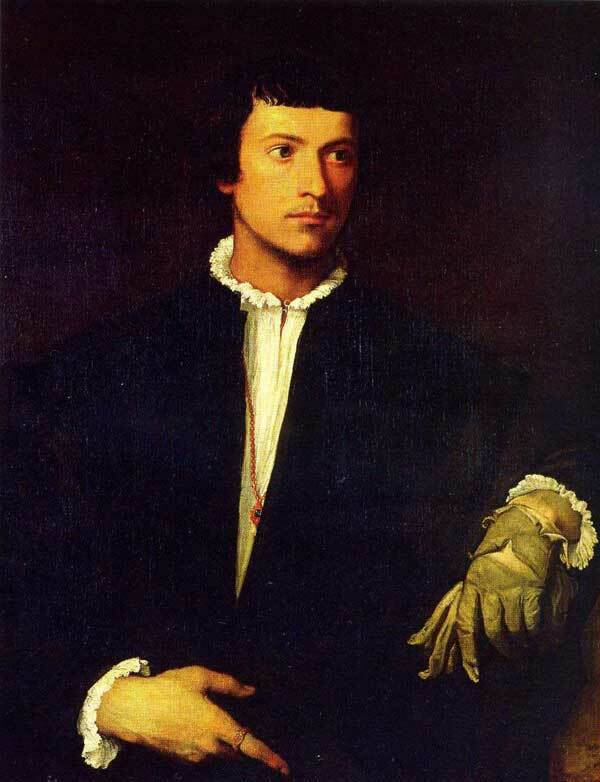 At the age of about twelve, he was apprenticed to the studios of Gentile and Giovanni Bellini, the leading artists in Venice, and it was here that he met Giorgione, an artist who exercised a great influence on his painting style, and who he later joined as an assistant. Some of the work between Giorgione and Titian has been the subject of controversy and attributing paintings to one artist or the other remains a contentious issue. He was not a great architect or sculptor like Michelangelo, or the inventor and scientist that was Leonardo's gift, he was just a painter, but a painter who fully utilised colour in his work. 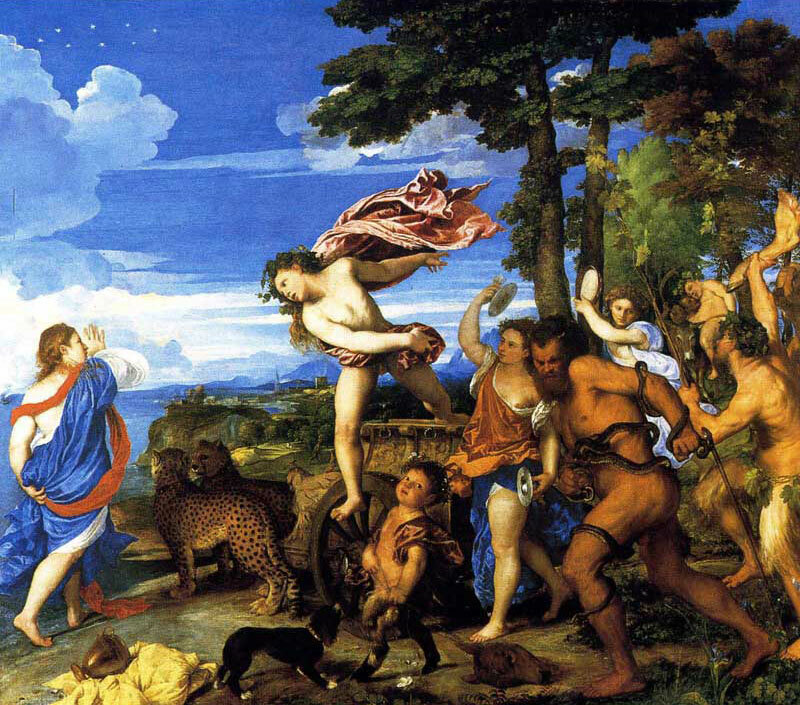 Titian's style did alter throughout his long life but his interest in colour never diminished. His use of paint and brushwork made him the foremost painter in Venice and his execution of both landscapes and portraits brought him great fame in his own lifetime. Titian seems to have left very few drawings, his work was done on the canvass, altering and modifying as he worked with total control over his medium. 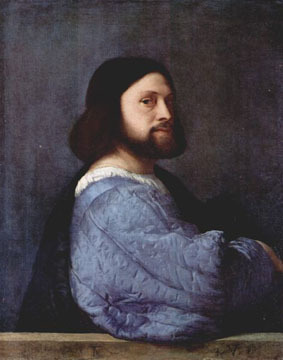 His early self-portrait of 1510 shows his great skill and handling of paint, and the swollen blue shirt sleeve is a fine example of his genius. Sacred and Profane Love is thought to be the image of a bride alongside the invisible Venus. It represents the joys of marriage and clearly owes much to the influence of Giorgione. The Venus is just one example of the love that permeates the artist's works, images that he clearly enjoyed painting. In 1518 he painted his "Assumption of the Virgin" the altarpiece for the Basilica di Santa Maria Gloriosa dei Frari in Venice. Also in the same church but painted in 1519-1528, his "Pesaro Madonna" is unusual in that it places the Holy Virgin out of the centre of the picture, this was unheard of at the time. Oil on canvas. 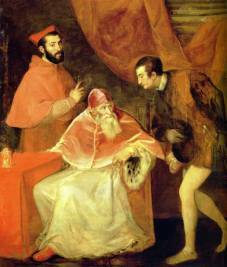 4.88 m×2.69 m.
After the death of Giorgione and Giovanni Bellini, Titian became the foremost painter in Venice. 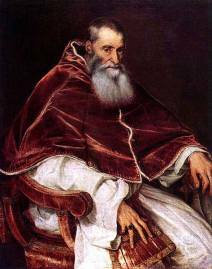 His work is varied and includes portraits, altarpieces and mythological works highlighted in the examples below. In 1523 the great artist was at the height of his fame and painted his Bacchus and Ariadne, part of his mythological series for Alfonso d'Este the Duke of Ferrara. Bacchus, the god of wine, has fallen in love with Ariadne and leaps from his chariot to greet her. She has been abandoned on the island of Naxos by her lover Theseus whose ship can be seen sailing away in the distance. Despite Ariadne’s initial fear of Bacchus she is raised to heaven in his chariot (drawn by two cheetahs) and turned into a constellation represented by the stars at the top left of the painting. 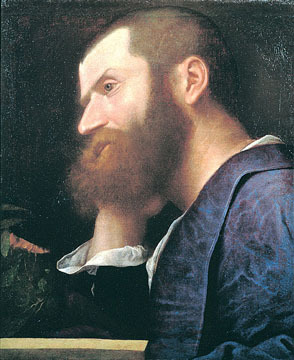 Aretino was a writer who scandalised Italy with his outspoken comments on the political and social life at the time. He is regarded as the first controversial journalist but was also a great champion of the artist's painting and praised his work for its depiction of reality and colour. Titian was married in 1525 to "Cecilia" and the couple had three or possibly four children one, Orazio became the artist's assistant. The Venus of Urbino of 1538, now in the Uffizi Gallery in Florence, shows the Venus reclining on a bed and the pose is based on Giorgione's Sleeping Venus. 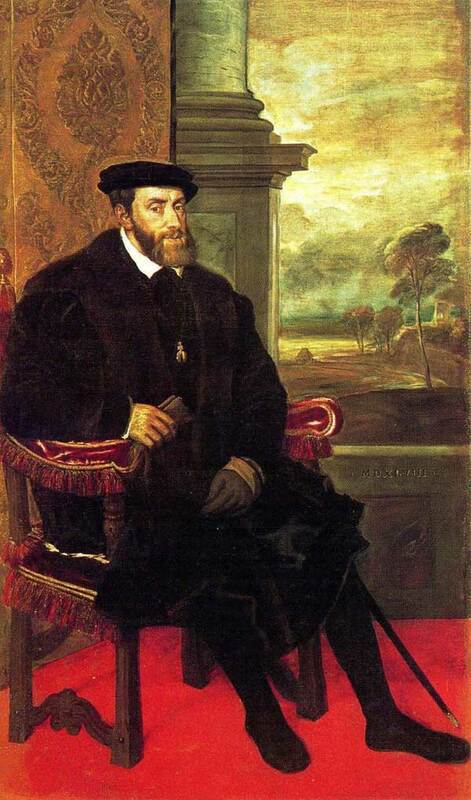 The artist was extremely successful and was even given the freedom of the city of Rome during a visit in 1546. 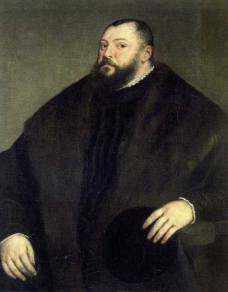 The last twenty-five years of Titian's life were spent mainly as a portrait-painter and in the service of Philip II of Spain. 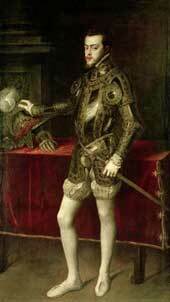 He had painted Philip's portrait in 1550 and had also painted Philip's father The Holy Roman Emperor, Charles V.
The artist's later paintings are executed with great freedom. He was so comfortable with his medium that one of his pupils, who had watched him work, stated that he finished the pictures 'more with his fingers than his brush'. 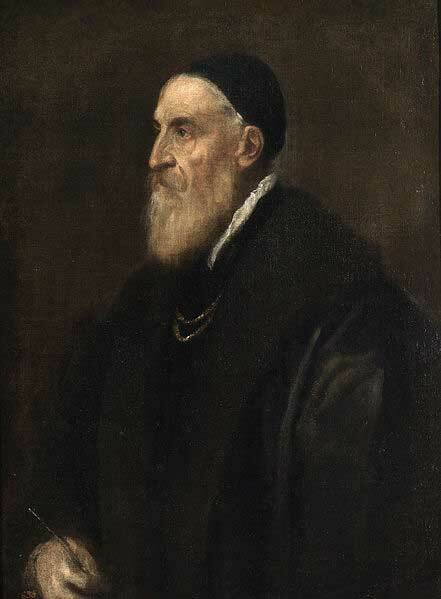 Titian's influence is extensive and his legacy is his use of rich colour and artists such as Rubens, Rembrandt, and Manet have taken inspiration from his work.